Cell phone use while driving is a problem in Louisiana: according to one report, nearly half of all drives in Louisiana include unsafe phone use—that’s more than any other state. When drivers get distracted, people get hurt. And when people get hurt in Louisiana, the lawyers at Cox, Cox, Filo, Camel & Wilson can help. Our car accident attorneys know how devastating a crash can be, especially one caused by a distracted driver. Below, we’ve outlined state texting laws as well as important facts and statistics to underscore the importance of focused driving. Share this information with your family and friends (especially teen drivers) to ensure their safety and the safety of others. Louisiana’s current distracted driving law includes a hand-held ban for drivers with a learner or intermediate license, a primary cell phone ban for bus drivers and novice drivers during their first year of licensure, and a primary texting ban on all drivers. No one in Louisiana is allowed to text and drive. Only experienced drivers are allowed to talk on the phone while driving with a hand-held or hands-free device; and certain drivers (i.e., bus drivers and commercial motor vehicle drivers) are prohibited from talking or texting regardless of experience. It’s also illegal to use a cell phone (talk or text) in a school zone during posted hours. According to Louisiana statute, texting includes any text-based messaging on any wireless device—posting on social media fits into this definition as well. Violations of the law include a minimum fine of $175. The maximum penalty is $500. According to a report published by the Louisiana Highway Safety Plan, texting and driving is most common among Louisiana drivers less than 25 years old; 25- to 34-year olds are also likely to text while driving. In 2017, nine Louisianans were killed in phone-related crashes. 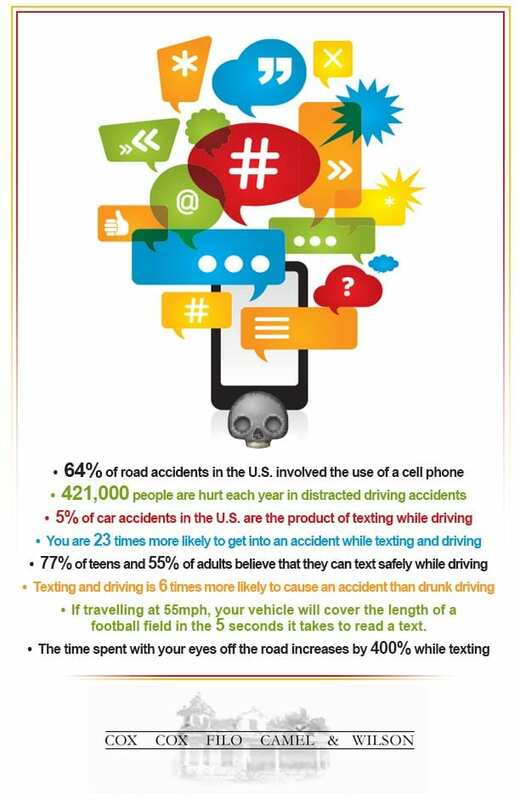 Cell phones and texting are common distractions, but they’re not the only threat. Eating, grooming, tuning the radio, and fussing with children or pets pose significant risks as well. According to the National Highway Traffic Safety Administration, approximately one-third of all U.S. drivers 18 to 64 years old read or send text or email messages while driving. Reading or sending text or email messages and other distracted behaviors lead to approximately 420,000 injuries every year. Studies have shown that drivers who interact with a handheld device are 6 times more likely to crash. Not all people can multitask effectively—most people engage in what’s called task switching. Psychologists have concluded that task switching reduces productivity and safety. Get more safety information that could save a life! ‘Like’ Cox, Cox, Filo, Camel & Wilson on Facebook for more!